Nice work! I was going to try making a predator this winter.I have a 1oz. Plastic version to go off of. From what I read the larger version fishes better? The Dalecki darter looks pretty cool.I'm guessing that's birch or maple? Little wood predator copies swim better than the small plastic originals in my limited experience making them. The 6" plastic plug is an excellent lure. I posted how to make it years ago in a thread called "Getting Ugly with It" I think. Eddy copied them and they swim well but I think the original has a more concave tail which helps. I don't think Eddy weighted his. I'm happy to send you a plastic original, Ryan, if you'd like. PM me your address. The one I pictured is a larger version and not a strict copy of the design (more of a shaped neck). I weighted it in front of the hook but have not tested it yet. I don't have an original Dalecki. I suspect they were maple or birch because people complained they often cracked but the ones I've built (with dimensions that are a guess from a picture so are likely off) came out too heavy in those woods (based on the advertised weight of 2oz that might also be inaccurate) so I'm trying some other woods. They are a pain to shape (particularly the maple) and it drives me nuts that he was able to build and sell these things in quantity. He must have had some sort of jig to speed things up but I can't figure it out. Paul Was it the one built by the Pro wood carver, with the 2 cabinets connected via 4" tubing on either side, then ducted to the outside? If so I built a similar cabinet based on his dimensions. Hey D. Good to hear from you. I don't think that was the one but sounds similar. He did have the fan part, box, a distance from the booth and double hoses, ducting, going to it. His reasoning for that was the paint over spray and fumes would dry in ducts before it reached the fan and not clog up the blower so no need for filters which clog and reduce the flow. Seems logical. I may have booked marked it so need to look but I do remember most of it pretty much. I started on these small 5" predators this week. Made a fixture for my bandsaw and was able to get consistent results. Surprised my saw was up to the task (it threw a tire on the bottom wheel awhile back and I just wrapped the bare wheel with electrical tape as a temp fix 2 years ago haha). Gotta thank rockfish9 for sharing his darter jig in an old thread,it helped me get an idea of how go about making mine. I've been at them as well. Test swam a 3oz version a few days ago. It has quite a slug of lead ahead of the hook and my impression was it might do better with even more. They are very buoyant and put their tail up and wag once you get them going but are hard to hold near the surface as such. When I fish the plastic versions I pull them down and slowly swim them back to the surface then repeat. I'll get you that larger plastic one out in the mail to you this week, Ryan.....I got sidetracked the past few days. Would the action be similar to a Nike? Kind of similar shape wise and it sounds like they have similar depth ability and action. The line tie is a bit below center and the face wider than a nike. Tends to act a bit like an exaggerated surfster. The nike goes under a bit more easily if I remember correctly. Very cool looking plug, I really like the lipless stuff. I may try and mess around with that kind of stuff again once I get going. I haven't been turning anything yet. Finishing up some house projects first although I am working on refinishing some plugs to get them back in the rotation. Started turning a big batch of 8.5" pikies, so fatties and some slims, both surface and medium swimmers hoping to have em all turned and drilled this week. Finished my first batch of plugs. Second coated wired. System 3 dry , hard and looks satifactory. Sealed the remaining pikes , once dried prime them andwill leave them for awhile to tend to rod work. Worked on making some darters this week, Got them all ready for sealer. There based on a Tattoo 2oz. version. I hydro oriented 4 of them and for the other I just made it so the grain runs vertical on the lip. Hopefully they swim, I'll test them next weekend if the sealer dries by then. Ryan looking good. The sealer should be ok in a week . What sealer? I've thrown testers next dry. No ill effects. Val oil - turps or spar -turps. Helps to have a warm spot to dry. Maybe if the fog lifts and sun comes out I may prime . Thanks Billy. I use spar and turps,usually hang them in the garage atleast 24 hrs till they don't smell as much. Got 15 spoon lips painted yesterday while it was 58 degrees out. 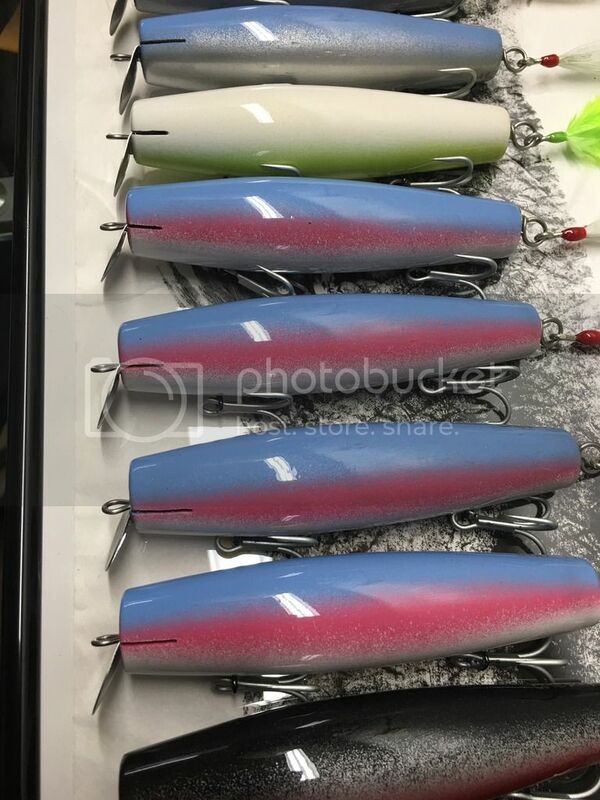 Did a few different colors than usual and few custom request for buddies I fish with. Finished drilling/sanding a big batch of pikies (65 total) this week. 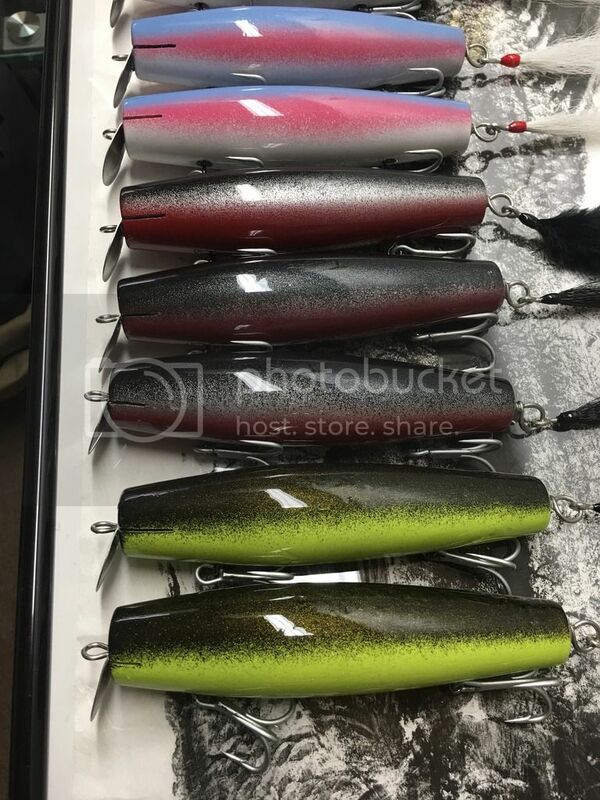 Did some surface slims 3.25oz , medium slims 4oz and 4.5oz surface fattys and a few of each size in squid  versions. Going to install the weights in the pikies today if I have time, but who knows. 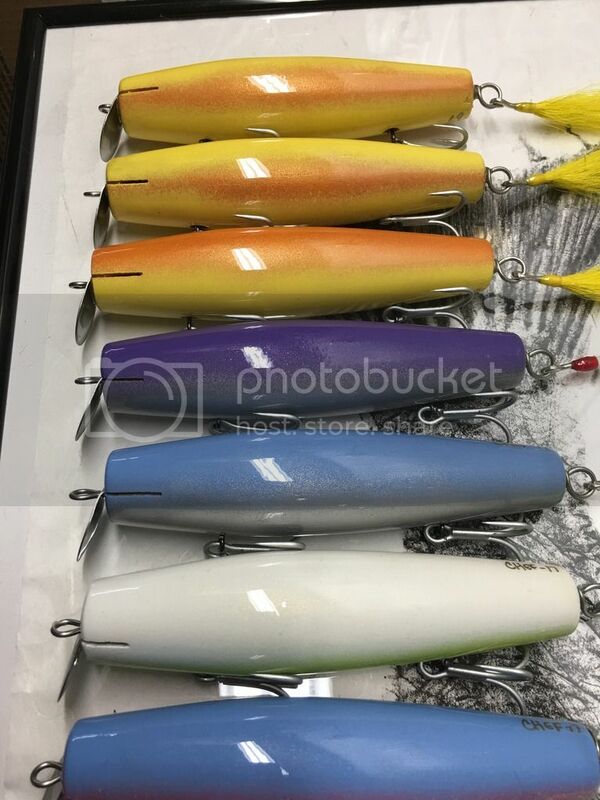 Got a few reproduction request for two buddies to make a masterlure pikie and that bob Hahn little swimmer. Do those and then move onto some needles, to fill out the bag this season. In my findings and when I used spar mix it always took at least 3-5 days depending on heat. I always tried to let em dry for a least a week. Since I switched to epoxy sealing I can paint with 48 hours and I feel it really helps the wood harden up. Oh man, I've got bodies everywhere. 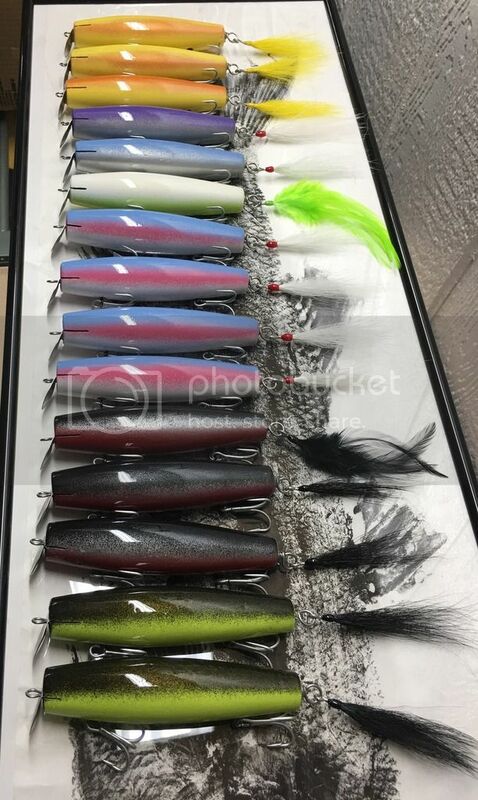 G2 clones, Skinny Donnys by the dozen, habs clone 2.5's, big predators, swim baits, a jinx, medium pikies, a few leftover lipless swimmers and darters, PTjude swim-a-long clones, a few skinny danny tries and the one thing I have to build, pencils, yet to go. Then there is the distraction of the Dalecki Darter thing. The idea of painting, epoxying, and wiring all this makes me queazy. Into an exhaust system. PIA and so darn time consuming. Hope to try and paint something soon. Missed Sunday morning but finally finished up some large needles for the upcoming season. About half are pine and around 2.8oz and the others are maple and 3.5oz. Will hopefully finish up some pine and maple Donny's in the next week or so as well. I've been epoxy sealing most plugs this year which takes a little longer but based on a few tests it seems to do a better job of sealing especially with the maple. Just threw the SS darter in there for size reference. I haven't taken that leap yet. Chris one thing to keep in mind, I use minwax wood filler (bondo) it's harder than soft woods so I concentrate on the putty with the sandpaper. I use 80 grit to take the bulk off then 180/220 to final sand the entire plug. I also don't sand the plug after I finish cutting . This leaves the dia. Slightly larger for the final sand. A good file is what I use on the filler before sandpaper. By hand. Some day and night colors, couple request for buddies in the CSA. Loads of fun potential in those.